The chief of police in the southern Iraqi city of Basra has warned of a campaign of violence against women carried out by religious extremists. It has, Maj-Gen Abdul Jalil Khalaf said, included threats, intimidation and even murder. Some victims were dressed in indecent clothes by their killers or had notices attached to them, he said. 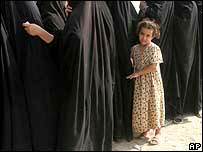 Women interviewed by the BBC said they no longer dared venture on to Basra's streets without strict Islamic attire. "There is a terrible repression against women in Basra," Maj-Gen Khalaf told the BBC. "They kill women, leave a piece of paper on her or dress her in indecent clothes so as to justify their horrible crimes." Forty-two women were killed between July and September this year, although the number dropped slightly in October, he said. In one case, he added, a woman was killed in her home along with her six-year-old son, who was rumoured to have been conceived in an adulterous relationship. Maj-Gen Khalaf, sent to Basra this year by Iraqi Prime Minister Nouri Maliki to impose order in the city, said the police were often too scared to conduct proper investigations into the killings. "The relatives are reluctant to report the crimes for fear of a scandal or because they despair of the police's ability to solve them," he added. A female lawyer in Basra contacted by the BBC by phone from London, who asked not to be named for fear of reprisals, said attacks on women in the city were occurring "every two or three days". She told the BBC about a university student who had been shot in the legs for not wearing an Islamic headscarf, or hijab. The lawyer also said that graffiti was painted on walls warning women to cover their heads or "be punished". She said she had been told by a group of men that she should be at home and get married instead of working. "They said to me: 'If anyone's willing to offer a good price for you, we wouldn't think twice about selling you'," she said. "When they see a woman going out to work and being successful, I'm sorry, but they feel inferior to her." A mother-of-six and government employee in Basra, who wished to be identified only as Um Zeinab, told the BBC she had almost been run down by a motorcyclist one day while waiting for her bus to work. "I was wearing a shirt with a skirt and some make-up, as I usually do," she said. "I was waiting at the bus stop when the motorbike headed straight at me, full speed." Luckily, the motorcyclist skidded and fell before reaching her. She said she had heard of other women attacked but who had not been as lucky. "Two women were killed in al-Makal district two days ago. People said they had received warnings before and then gunmen came to their homes and killed them, one in front of their kids." Given the continuing power struggle in Basra between rival Shia militias, it was perhaps understandable that Gen Khalaf would not be drawn into naming names. He blamed "dangerous criminals" trying to undermine stability in the city. He also said that repression against women had been going on while British forces were still in the city, prior to their withdrawal to Basra airport in September. Others were more direct in pointing the finger of blame at the rival Shia militias, known to have infiltrated the police and vying for control of Basra. Um Zeinab called them "dark, fundamentalist extremists". But he did not rule out that others were doing so.